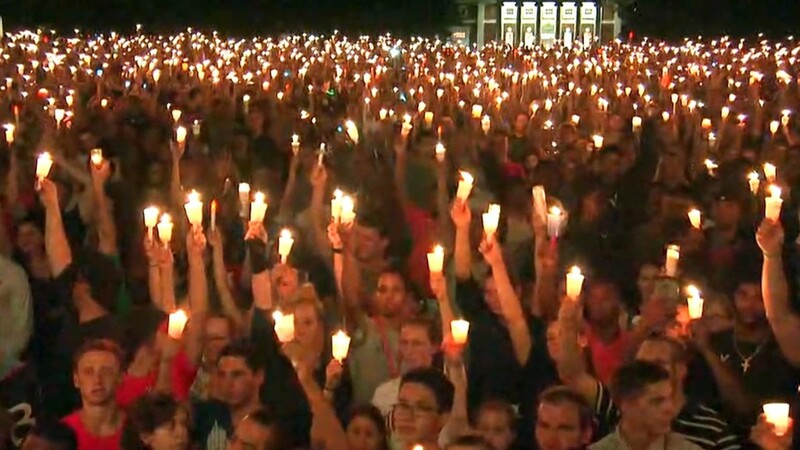 A gathering of thousands of people at the University of Virginia on Wednesday evening was organized without social media. That was at the request of the dozen or so students and faculty who organized the vigil, which aimed to "reclaim" the university's grounds after last weekend's violence. On Saturday, a white supremacist rally turned deadly in Charlottesville; the evening before, white supremacists marched through the university's grounds with torches. "We will retrace the path that was marred by hate and violence on Friday night in order to reclaim those spaces throughout Grounds and mark/cover them with LOVE and PEACE," read a text message that circulated among community members. The organizers made a conscious effort to spread the message of the gathering through text messages and phone calls to ensure the event invite didn't get into the wrong hands. "Please note: this is NOT to be shared on social media or even via email," read the text obtained by CNN Tech. "We want this to spread via word of mouth (call or text) so that only loving people hear about the event." "Safety was a huge concern. We wanted to make sure everyone felt they could feel safe in this space," one of the student organizers told CNN Tech. "The best way we felt we could do that was by containing the message." The University of Virginia administration also engaged in what it called a "whisper web campaign," according to Siva Vaidhyanathan, a media studies professor. "Hundreds of professors received an email that said, 'Meet by the statue of Homer on the Lawn at 4p.m.,'" Vaidhyanathan told CNN Tech. He said there was a "total social media blackout" because there's still a lot of "bad guys" walking around the community. "I went around to faculty offices to spread the word," he said. The low-tech effort is a reaction to what happened last weekend. Organizers of the white supremacist rally had used Facebook to coordinate the event and, according to the Southern Poverty Law Center, platforms like PayPal to secure funds. Tech firms have started to draw new lines on servicing hate groups. The event, which was sanctioned by the university, brought together between 5,000 and 7,000 students, faculty and Charlottesville residents, the student organizer said. Attendees lit candles and took a moment of silence for the three lives lost on Saturday. Someone recited Maya Angelou's poem "I Will Rise," people sang the line "We are not afraid," from the song "We Shall Overcome," and chanted UVa's alma mater cheer, "The Good Old Song." "This was done because everyone decided to text one person, or call a friend," the student organizer said. "By reaching out to just a few individuals, word spreads quickly. The fact that we didn't use social media speaks to the power of the Charlottesville community, inclusive of UVa." --CNN's Nora Neus contributed to this report.